These are a few photos from a Victorian tiled hallway we restored in Edinburgh. The property is close to the beautiful city centre and is in a road with other Victorian properties. The floor was once stunning but was now overdue some love and care to restore it back to its’ former self. 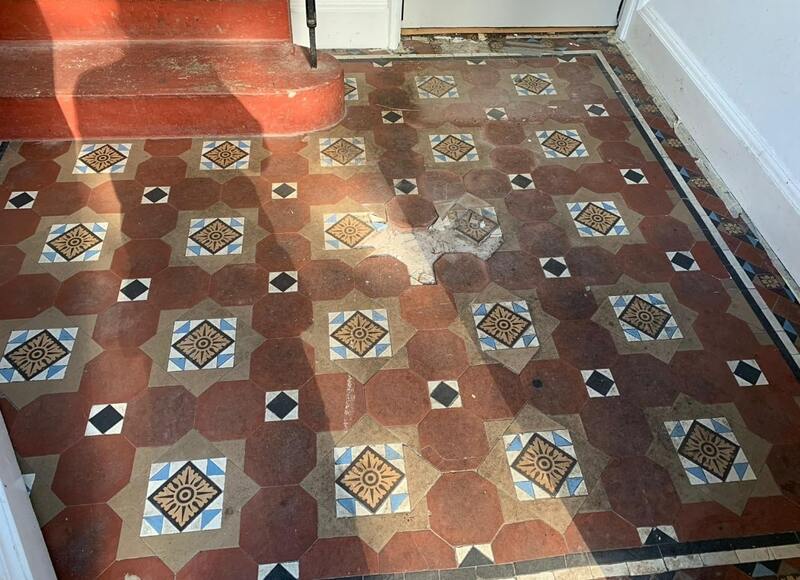 We went over to the property first to survey the floor and see for ourselves the extent of the work required before quoting for the restoration. 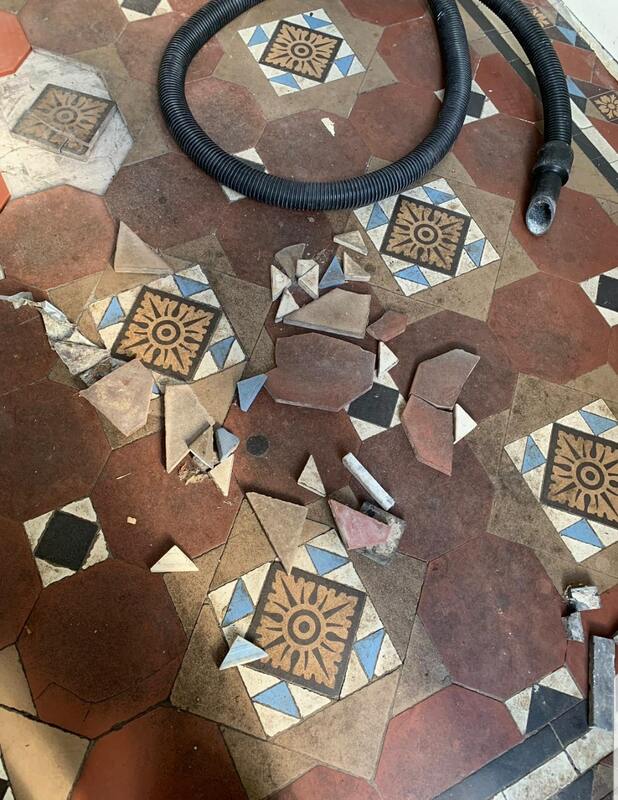 The floor was incredibly dirty and there were a number of broken tiles that would need to be replaced or repaired. There are handful of companies where you can source matching tiles but with a floor of this age its not always possible. We discussed with the client the process we would follow to restore the floor which would take three days and agreed a price and date for the work. We also took away with us some of the broken tiles to assist in tracking down matching replacements. We arrived on the first day and started by taping up the adjacent woodwork to protect it. The next step was to ensure the floor was completely sound before starting the cleaning process which meant dealing with the loose and broken tiles. 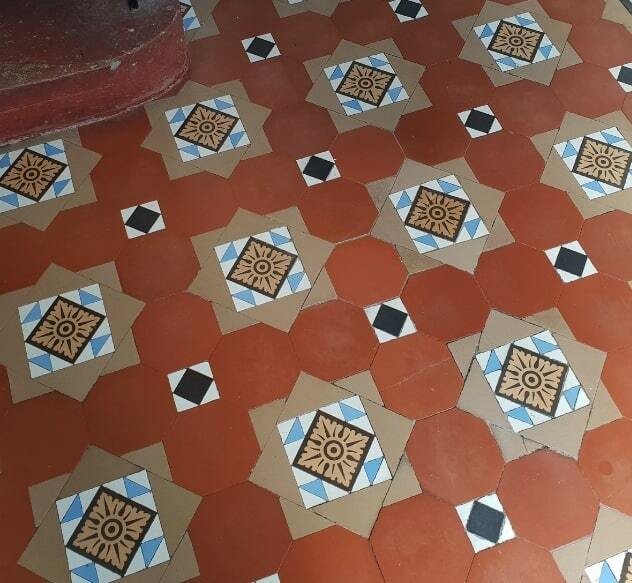 The loose and broken tiles were removed and then replaced with new reproduction Victorian tiles that we had managed to source from Original Style. The tiles were cut to fit and then set into the floor with tile adhesive. Unfortunately, we were unable to source a replacement for a broken center pattern tile which had an intricate pattern, so we had to secure this back in place using the two broken pieces. With the tiling work completed there was nothing else we could do so we left to allow the adhesive to set. Returning the following day, we began the cleaning process using a set of coarse burnishing pads fitted to a rotary machine. 100, 200 and then a 400-grit burnishing pad was applied in sequence. Then after going over the floor a few times with the pads the floor was rinsed with water which was then extracted with a vet vacuum to remove the fine slurry that was generated. This process ground off the dirt and refined the surface of the tile ensuring the old and new tiles made a perfect match. The next step was to give the floor an acid wash using Tile Doctor Acid Gel which is scrubbed into the tiles and then rinsed off and extracted as before. This allowed us to get the tiles as clean as possible without the need of any alkaline cleaning products which can cause efflorescence issues later when the floor dries. Efflorescence is a common problem on floors of this age where a damp-proof membrane has not been fitted; moisture rises through the sub floor and tile carrying salts which then get deposited on the surface of the tile as the moisture evaporates. Once complete the floor was left to dry off overnight in readiness for sealing process the next day. On the final third day we returned to seal the floor testing the moisture level first with a damp meter to ensure the floor was dry. The results were positive, and I was happy that it was within the correct tolerance for the sealer to be effective. To seal the floor, we used Tile Doctor Seal and Go Extra, applying 5 coats and letting each coat dry before applying the next. The sealer gave enhanced the look of the floor leaving a hardwearing sheen surface which will protect the tiles will also make them easy to clean going forward. This sealer is also fully breathable which is perfect for a floor with no damp-proof membrane in that it won’t trap moisture under the tiles where is could eventually spread to the walls and lead to rising damp. 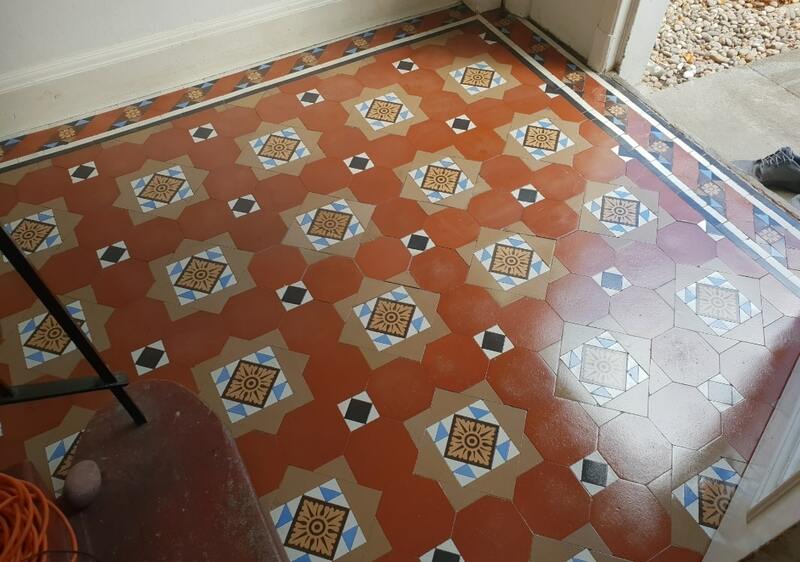 The client was very happy with the restored floor, the colours were now very vibrant, and the dull entrance hall had been transformed to an inviting space. 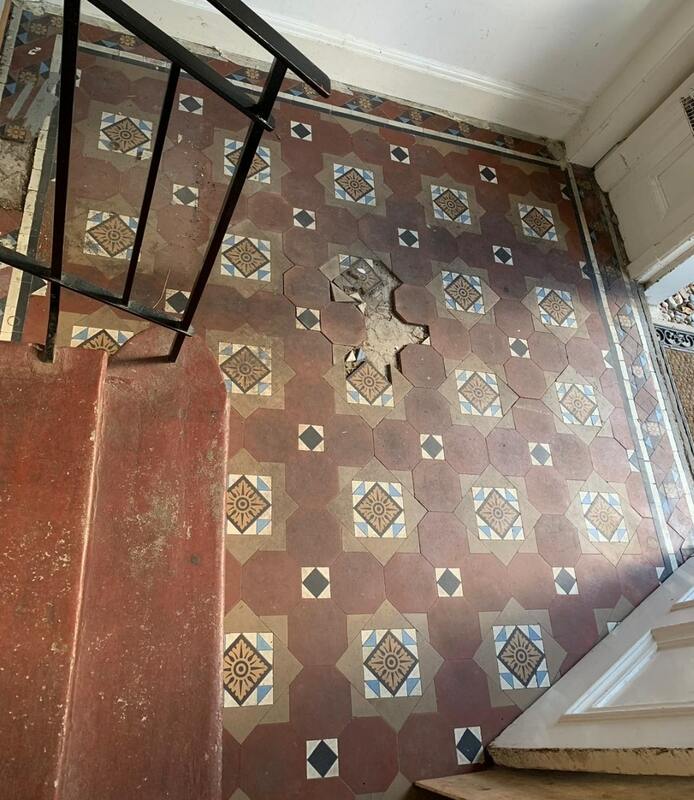 This entry was posted in Work History and tagged Edinburgh, efflorescence, Floor, floor restoration, Hallway Floor, tile cleaning, Tile Replacement, Victorian Floor Restoration, Victorian Tiled Hallway by abzdominise. Bookmark the permalink.